The so-called Ghetto, a concentration camp for Jewish prisoners from the then Protectorate of Bohemia and Moravia, later also from Germany, Austria, the Netherlands, Denmark, Slovakia and Hungary, was established in Terezín on November 24, 1941. After the Nazi occupation of the Czech lands, the Magdeburg Barracks, as the former Jan Jiskra of Brandýs Barracks were originally known, played a particularly important role in the Ghetto. The Barracks housed the offices of the different departments of the Ghetto’s so-called Jewish Self-administration, as well as flats of some of the Ghetto’s leading office holders. But the Magdeburg Barracks were also known as a venue of major cultural events, divine services, lectures and meetings. Its cardinal wartime importance was eventually reflected in a plan to reconstruct the entire building and use it for museological and educational purposes. The museological section of the building is primarily devoted to presenting, as truthfully as possible, the actual cultural life of the Ghetto inmates, whose true nature had been often distorted in the past. The transports coming to Terezín in the years 1941–1945 brought in many leading lights from different cultural domains. On the other hand, there was a great hunger for cultural activities among the Ghetto inmates. This, in turn, was conducive to the promotion of a broad range of cultural pursuits, incomparable – in terms of their concentration and artistic standards – with any other place in the war-ravaged Europe at that time. All things considered, a death sentence already had been passed over all the prisoners, and that was why both the active participants and performing artists as well as organizers of such cultural programs were given a free hand and relative leeway. The task to prepare cultural events was assigned to the Jewish Self-administration, which organized concerts, theater performances, a rich offer of lectures and other programs. The Ghetto’s cultural life proceeded, just as any other activities in Terezín, under the enduring threat of transports that kept carrying away both protagonists and spectators of such cultural events to places of annihilation or slave labor. Only very few participants and eyewitnesses of the wartime cultural events in the Ghetto lived to see the end of WW II. Those who did then tried hard to preserve the cultural legacy of the Terezín Ghetto as a testimony to the spiritual resistance of the victims of the Nazi genocide. The fascinating story of this unique chapter in Europe’s cultural history constitutes a message that is known to address also present-day people with a particularly strong impact. The entire first floor is reserved for permanent exhibitions connected with the topics treated in the main display in the Ghetto Museum. 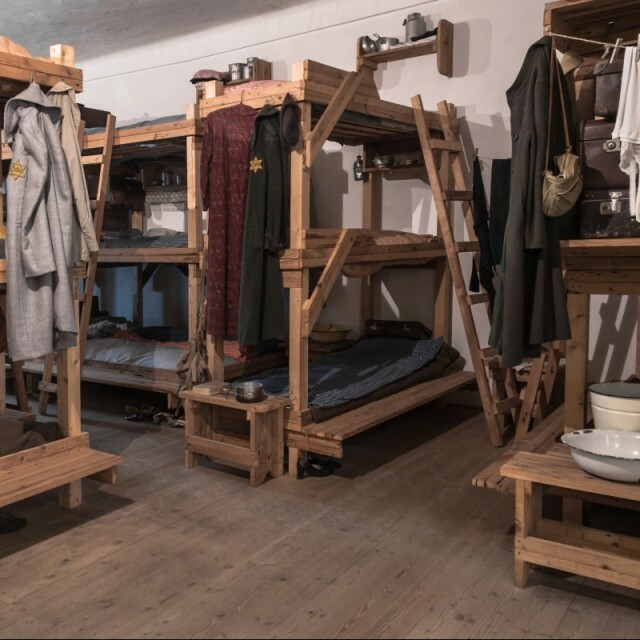 A reconstructed dormitory of the inmates from the time of the Ghetto is situated in the left part of the exhibition floor, offering an example of mass accommodation of prisoners in a typical Terezín barracks. The neighboring room houses an exhibition called ”Music in the Terezín Ghetto“, highlighting not only the importance of music for the life of the Ghetto inmates but also the key personalities of its musical life. Part of the exhibition is a study nook for people keen on gaining a deeper insight into the subjects on display. In the remaining exhibition premises, visitors may view an exhibition called ”Art in the Terezín Ghetto“. This presents both works of art created by the best-known artists who stayed in the Ghetto as well as works by lesser-known authors. In their entirety, the exhibits provide a reliable testimony and a vivid picture of the life, hopes and anxieties of the Ghetto inmates. The exhibitions called ”Literary Work in the Terezín Ghetto“ and ”Theater in the Terezín Ghetto“ are installed in the right section of the exhibition floor. The latter display is found at the end of the corridor, opposite the reconstructed dormitory from the time of the Ghetto, where the sightseeing tour of the Museum exhibitions started. Employing specific scenic effects, this display succeeds in conjuring up the atmosphere of the life of the inmates imprisoned in the Ghetto. In this way, the visitors seem to be returning to the Ghetto at the end of their sightseeing tour. The whole complex of exhibitions comes complete with the latest display called ”Truth and Lies“, which is devoted to the filming of Nazi propaganda documentaries in the Terezín Ghetto. This is situated in the first courtyard of the building.